The Multifunctional Centre and the Development of the Natural Environment project are essentially two separate projects within the same location---a large natural park surrounded by the city of Yecla. These two projects makes an effort to have a strong relationship with its urban surroundings and as well as with each other. With the strong sense of urbanity within the city, it is crucial to ensure that any future developments or interventions towards the natural landscape do not compromise the physical and spatial qualities of the park as a green space. 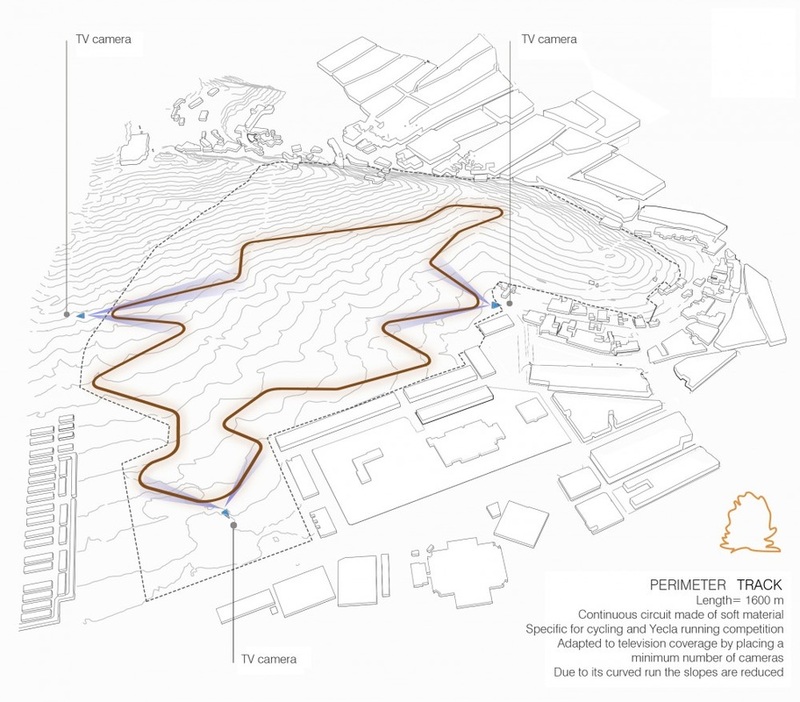 The intervention strategies that was adopted in developing the design was to propose a series of activities within the park without leaving or creating negative impact towards it that could inform a symbiotic relationship between human and nature. 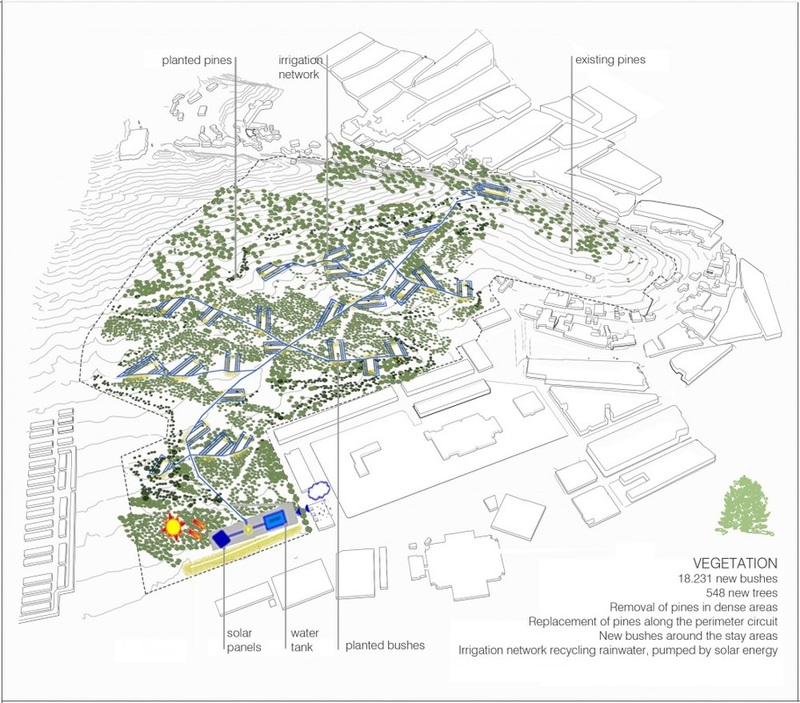 These two project aims to transform the park area---adding function to the open space for human inhabitance---without imposing major earthworks and alterations that could damage the forest and the continuity of vegetations and biodiversity. 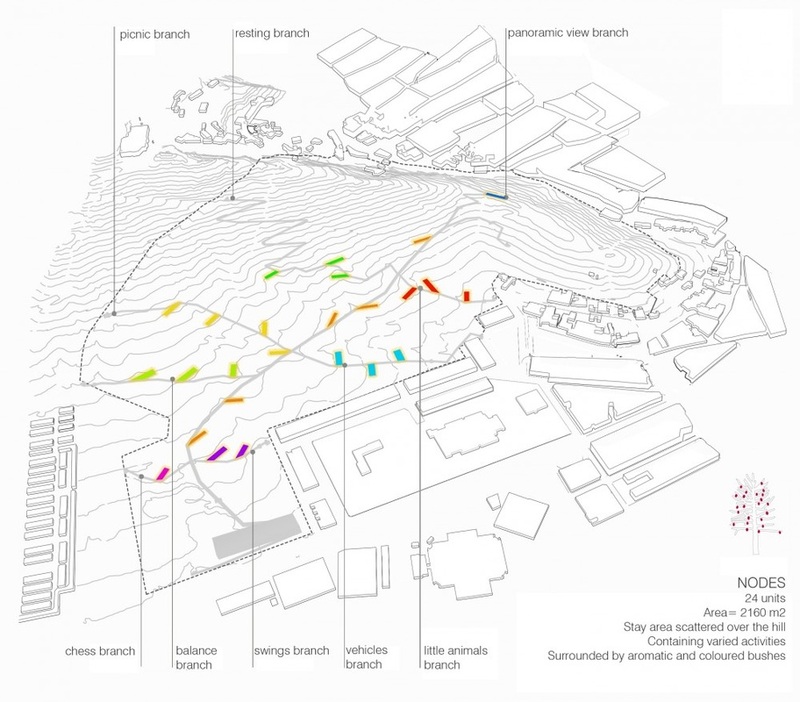 Drawing inspiration from the structure of a tree, the multifunctional building that sits at the edge of urbanity constitutes the root of the tree and slowly disperses through the landscape area in the form of main paths as the trunk and secondary paths as schematic branches. This network of pathways is formed by a long wooden carpet strip that runs through the park, creating several nodes where the insertion of urban activities could happen. The Multifunctional Building is located at the fringe of the city, just before the landscape area and acts as a gateway to the natural park. The location of the park allows minimal disturbance to the existing trees without having to perform drastic earthworks and construction works. Its presence aims to generate a significance at the urban level and as well as draw people into the park. The building is designed as a flexible space that is equipped with mobile partitions that can alter the size and need of the space for different situations. Infrastructures such as benches, signages and information boards are designed along the pathways. A soft, winding circuit is designed along the perimeter of the landscape area that hosts series of sports activities that could happen in conjunction with the celebration of Cross de Yecla, a town event. A low number of cameras (not more than 5) are installed along the circuit, allowing television coverage during times of the event. Pine trees have to be removed in setting up this facility however the designers eventually replanted pine trees at different areas of the park in order to maintain the original number of trees. The gesture of using pine as the main materials for pathways, finishes material and landscape infrastructures acknowledges and brings out the identity of Yecla as one of the major pine manufacturing cities in Spain. The project is carried out using several pine by-products such as strips, planks, logs, square timbers, bark, chips and wood wool. The tectonic quality of pine also allows the intervention elements to sit within the context without screaming to be different. 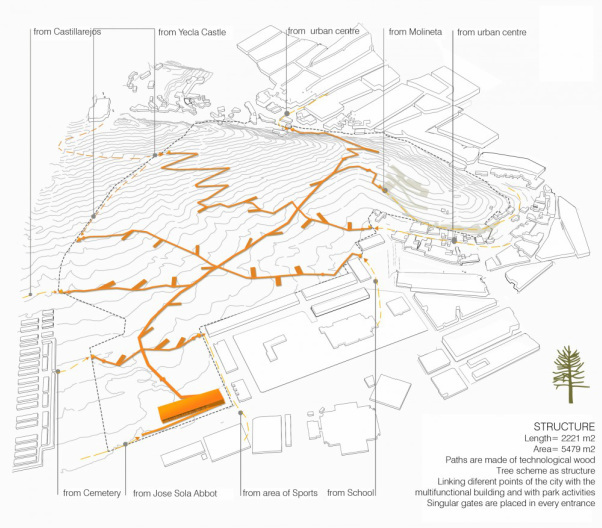 It also allows the designer to transform the site without having to undergo major intervention impact on the earth. Instead of creating new tracks for circulation, the long wooden strip carpet is installed on top of existing pathways to minimize implementation footprint. As for the multifunctional building, active and passive design approaches have been taken to into consideration. The facade of the building is cladded with stripped pine logs for solar protection purposes. Specific design and calculations have been made to optimize the building’s energy needs throughout the year. Light and shadow as a result of gaps between logs along the facade coupled with the timber finishes as flooring creates the feeling of being immerse within nature. As the natural park is being wrapped around by urban development, it is important to ensure that the park does not lose its qualities within the city. The challenge is how to maintain the calmness within a green space within the hustle bustle of the city. Proposed interventions that could increase the usability of the landscape space so that it could serve a purpose to the city should at the same time not compromise the physical conditions and biodiversity of the park. The landscape park and multifunctional building serves as a get-away location of urban dwellers in search of leisure and relaxation space. It becomes a social public gathering space where different activities could take place within the park.